This puréed butternut squash recipe is one of my favorite side dishes, especially for cold winter nights by the fire with a hearty red wine and a roast bird. Okay, so its not a barbecue grill recipe per se, but its flavors compliment roast and grilled poultry splendidly. The rich, creamy texture, the hint of pepper and nutmeg spice, the sweet squash, they work perfectly with a smokey roasted or grilled bird, conjuring up fond memories of childhood winter holiday parties with roasts with all the fixin's. I don't know what it is, but there is something magical about the marriage of this butternut squash recipe with the fireplace cooking string-turned ginger-tarragon roast chicken recipe I have listed elsewhere. In my household this is one of the current "favorite dinners". As I've said with that recipe, serve the roast chicken recipe with this purréed squash recipe and wash it down with a rich, rustic wine like a Chateauneuf-du-Pape or Bandol. You will not be disappointed! Winter squash - 3 pounds, seeded, skinned and diced; I use butternut squash but you can use pumpkin, Hubbard, etc. I like to cook this butternut squash recipe ahead, let it sit and cool in the pot while cooking other things, and then later reheat it at the last moment, so start it early. In a large heavy pot or sauté pan, I like to use an enameled pan like Le Creuset, melt the butter and add the onions. Stir gently over medium-low heat several minutes until soft but don't let them get browned or colored. 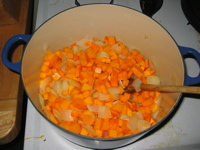 Add the squash and several large pinches of salt. Stir and then cover. Reduce the heat to very low and cook about 45 minutes, stirring occasionally. 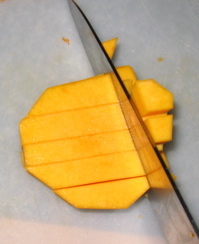 It is done when the squash is soft and starting to fall apart, falling into a puree. Grind over pepper to taste as well as a couple pinches of nutmeg (I strongly recommend fresh whole nutmeg scraped over a grater) and stir in. Purée in a food processor or hand blender, in batches if necessary. Stir in the cream, just enough to create a creamy, loose consistency. But you don't want it runny. If you can pour it easily, it might be too loose. If too loose, you can simmer over very low heat with the cover of to reduce and concentrate it a bit. Taste for salt and add enough to really bring out the flavors. Just before serving, reheat over medium heat, stirring frequently. Serve with your favorite roasts. As I've said, it is especially good with the fireplace string-turned ginger-tarragon roast chicken recipe. Are you done with this butternut squash recipe? Return to check out more barbecue grill recipes.